One of the "Baltic Three", Latvia sits sandwiched between Lithuania and Estonia. It is a small country with a population of only a couple of million, but since joining the EU in May 2004 it has been booming. Latvia regained its independence in 1991 at the fall of the Soviet Union, and many of the residents (over 40%) are still Russian. 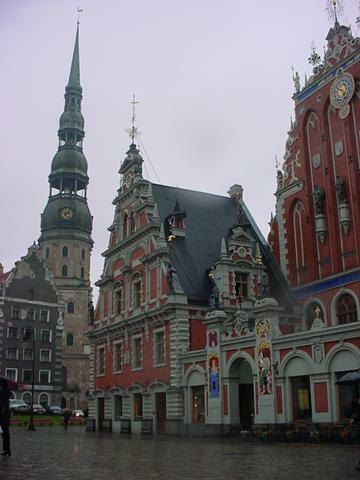 In summer 2004 we arrived in Riga, the Latvian capital, on an overnight train from Moscow feeling not altogther bedraggled. Our hostel was called "Posh Hostel" and was next to the market area. We only stayed one night and it rained incessantly, but we had a good night out in a Latvian club with a new friend we found, in of all places, an Irish pub. 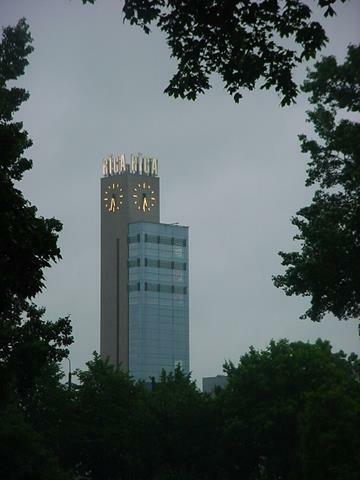 There has been a reasonable amount of urban renewal in the centre of Riga, such as the new station-shopping complex with its clock tower here. It says "Riga" at the top in gold letters. At the time we were in town, prices within the shops were like prices in Britain in the late 1980s, and especially easy to determine as the Latvian currency (the Lat) had a 1:1 exchange rate with sterling. I bought a Mars bar for 20p. 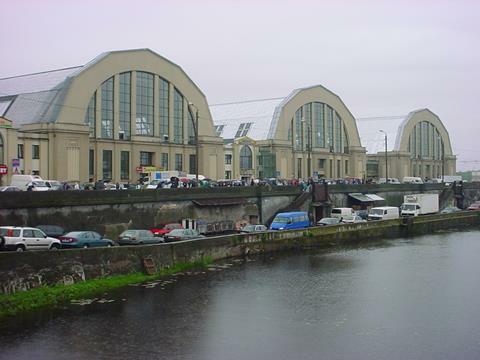 Riga Central Market is housed within retired zeppelin hangers. They were acquired during the 1930s from Nazi Germany in prefabricated sections, allowing a budget market to be constructed. I had a belt-busting lunch inside for the sum total of 39 pence. Livu Square is one of the centres of old Riga, and is lined with pretty buildings which were still doing their best to look photogenic, despite the rain. The place had quite a Germanic feel to it, and in the background you can see the spire of Rigas Doms, the cathedral. Perhaps the most iconic and recognisible sight in old Riga is the Blackheads House, built in 1344 for the Brotherhood of Blackheads guild of unmarried merchants. It was damaged during the second world war, and further flattened by the Soviets, but was restored for all to enjoy again in 2000. The spire on the left is the Rigas Doms cathedral tower, a testimony to the centuries of German dominance in the region. Construction began in 1211. 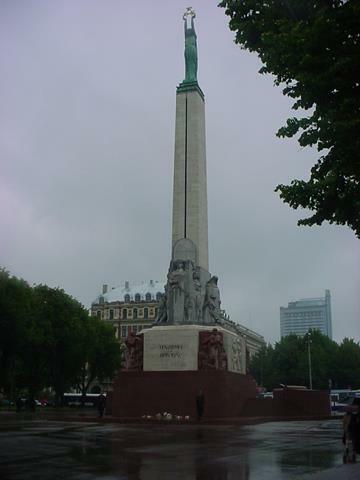 The Freedom Monument is a potent symbol of Lativa, built in 1935 it is surprising that it was not destroyed by the Soviets. 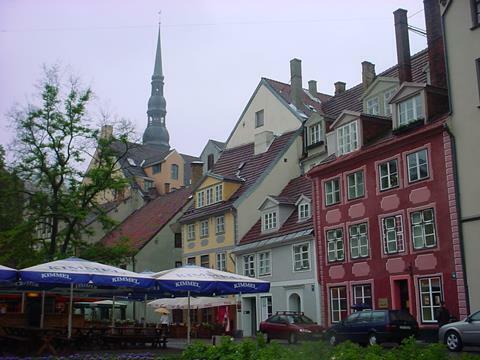 It is topped by the Statue of Liberty, Milda, holding three stars for the three regions of Latvia. During the Soviet regime the monument acted as a travel agency; anyone daring enough to lay flowers at its base would get a one-way ticket to Siberia.